Read the article directly on billboard.com or click image below to open pdf file. 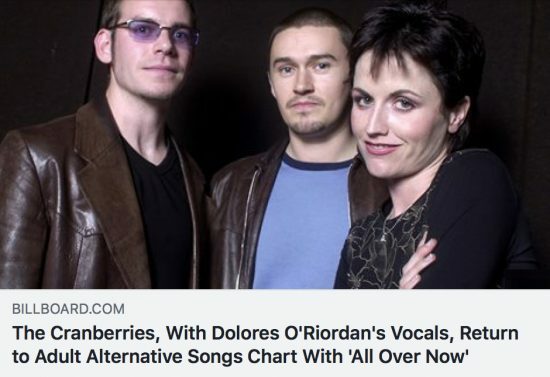 So glad to hear the cranberries return to the charts give them one last album that sells good and go out with a bang! Dolores and the cranberries lads deserve this! The Cranberries rose to international fame in the 1990s with their debut album, Everybody Else Is Doing It, So Why Can’t We?, which became a commercial success. The band has sold over 40 million records worldwide, and achieved four top 20 albums on the Billboard 200 chart (Everybody Else Is Doing It, So Why Can’t We? ; No Need to Argue, To the Faithful Departed, and Bury the Hatchet) and eight top 20 singles on the Modern Rock Tracks chart (“Linger”, “Dreams”, “Zombie”, “Ode to My Family”, “Ridiculous Thoughts”, “Salvation”, “Free to Decide”, and “Promises”). Sorry, no one from the CW team does this. I guess you could do it as wikipedia editing is available to any registered user and possibly unregistered user as well.